When there is a concern for dangerous communicable diseases spreading, the CDC activates pandemic mitigation measures. Quarantines can last anywhere from days to months depending on the severity of the contagion. Now is the time to plan and prepare for this type of disaster. No doubt many of you have heard of the confirmation by the CDC that an Ebola victim was admitted to the Texas Health Presbyterian Hospital in Dallas. Response teams were deployed to the Dallas area shortly after the announcement to watch individuals who the patient may have come in contact with. Dr. Tom Freiden, director of the CDC states, “Once those contacts are all identified, they’re all monitored for 21 days after exposure to see if they develop a fever.” If they do develop symptoms, then they will be placed in isolation to prevent further spread of the disease. It is entirely possible that our world leaders waited too long in responding to the Ebola outbreak. To date, the outbreak in West Africa has sickened more than 6,000 people and killed 3,083, and experts believed it was only a matter of time before the virus hit closer to home. My question is if the experts knew it was only a matter of time, why have they not provided any actionable information or advice to the American public? It is not my intention to evoke hysteria, but creating emergency care facilities, the state department purchasing 160,000 Ebola Hazmat suits, government officials contacting funeral homes and advising them how to prepare corpses that are infected with Ebola, but not providing information to the public other than to wash our hands and stay calm is a great disservice. When there is a concern for dangerous communicable diseases spreading, the CDC activates pandemic mitigation measures. Among these measures are: isolation and quarantines. These are the first steps in protecting the public by preventing exposure to infected persons or to persons who may be infected. Social distancing measures will follow in order to reduce further contact between the community. Quarantines can last anywhere from days to months depending on the severity of the contagion. Mandatory quarantines are backed up by laws and executive orders. At the very least, a mandatory quarantine would last as long as the contagion exists in the community. Therefore, plan on having at the very least one month’s worth of supplies. The three day mandatory quarantines that occurred in Sierra Leone resulted in food shortages in many parts of the country because the citizens were not prepared. Now is the time to prepare your homes and your families for riding out this type of disaster. This type of disaster is very unique in that you will not be able to run to the store if your supplies run out. A mandatory quarantine of this nature will require that the roads are clear of anything other than non-essential travel. Further, the shops and stores that you are dependent on will no longer be available; therefore, you need to have everything in place before mitigation measures are activated. Avoid contact with others and limit social protocols – resist shaking hands, kissing, hugging. Limit your exposure as much as possible. Make a plan. Daisy Luther provides an excellent template for creating a pandemic plan. 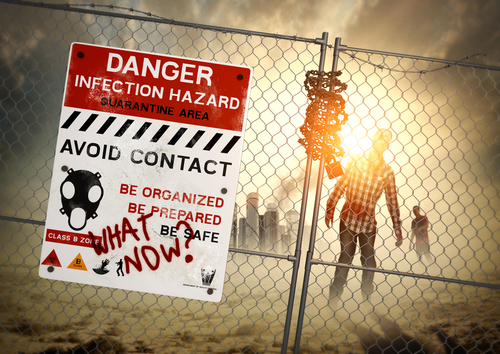 Further, to prepare for a pandemic event, if you plan on bugging out, do it before the quarantine measures are placed. Talk with country cousins about staying with them for the duration or begin fixing up any remote properties in preparation for a long term pandemic event. Make preparations and discuss with family members the family’s pandemic plan. Have some entertainment available to family members: board games, books, art supplies, etc. For those with special needs, ensure that you have supplies ready for them (infants, elderly, handicapped, etc.). If a family member dies in quarantine, seal off the room until professionals can deal with it. Don’t risk it. If you decide to take matters into your own hands, Wear long pants and long sleeves. Tuck your sleeves into your gloves. Dig your grave prior to moving the body. Spray the areas of the body you intend to touch with your bleach solution and wait 10 minutes before touching the body. Avoid touching the torso and head of the deceased person and only touch the disinfected extremities. Disinfect you clothing and shower after the operation is complete. Stay isolated until quarantine is lifted. In addition to the N-95 respirator masks, you may also consider upgrading to the more expensive N-100 respirators recommended by the World Health Organization. To read more about pandemic preparedness, click here. Store 1 gallon of water per person per day, in clean plastic containers. Your list should include a dependable rifle, shotgun and sidearm w/ ammo of course. Printing this list. Thank you so much for this post. reading the list, considering the costs and meticulous efforts required and knowing that all this would not provide absolute protection…..well, welcome to hell. as to what will eventually happen? your guess is as good as mine. had the world leaders jumped right onto the band wagon? the complaint and outcry would have accused them all of fear mongering.